I just had one of the most spirited journalist workshops that I have ever helped organize. It took place for four days since Sunday in Manokwari, a town in the Bird Head area in Papua. 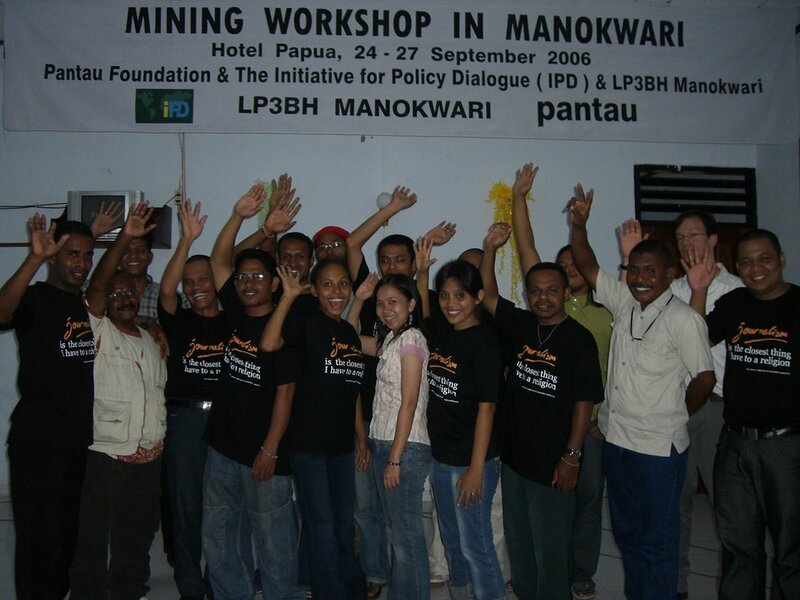 Columbia University's Initiative for Policy Dialogue helped sponsor this program in Manokwari and Balikpapan. Pantau also works with the Institute of Research, Analysis and Development for Legal Aid (LP3BH) in Manokwari to organize this workshop. It began on Sunday afternoon with around 20 journalists, coming from as far as Teluk Wondawan (about 20 hours by wooden boat) and Sorong (one night ship ride). Agustinus Nauw is a veteran reporter, covering mostly human rights abuses in the Teluk Wandawan area. He came late due to the slower wooden boat. Wilman Ramdani of Tambang (Mining) magazine in Jakarta also attended this workshop, saying that it is worthwhile to travel several hours from the metropolitan Jakarta for our workshop in remote Manokwari. Wilman and I arrived on Saturday, working with Jo Kelwulan and Jimmy Prawar to distribute workshop material door-to-door, to check the venue at Hotel Forest Papua and to discuss about an unexpected conference of the government-sponsored Indonesian Journalists Association (Persatuan Wartawan Indonesia or PWI) in Manokwari to start Wednesday. Jo, who is a Tanimbaran, writes columns for the Sorong-based Fajar Papua daily while Jimmy, who is a Biak but born in Manokwari, works at Matoa FM radio in Manokwari. Tanimbar is a small island south of Papua. PWI is a rather notorious organization. It helped clamp down media freedom during the Suharto era. In 1995, it reported an independent journalists' group to the police for publishing "unlicensed and thus illegal." Three journalists, namely Ahmad Taufik, Eko Maryadi and Danang K. Wardoyo, were arrested in 1995 and later jailed between two and three years. Now it tries to set up a branch in Manokwari. Max Simatauw, the PWI leader in Manokwari, already called Jo, asking Jo why the workshop organizer didn't report to him about having a workshop. Jo replied that they had already secured a police permit. Jo and Jimmy were a litle bit worried if the PWI was to retaliate. In Manokwari, the PWI is an organization closely related to the government. Simatauw already aired his idea of having Manokwari journalists to wear PWI press card when covering the West Irian Jaya's Governor Office. Without that card, they cannot enter the office. But the workshop opened with a warm introduction Sunday afternoon. I began the sessions with a refreshment on the basics of journalism, using Bill Kovach and Tom Rosenstiel's "Elements of Journalism." It was an interactive session. Keith Slack and Eva Danayanti also arrived from Jakarta Sunday afternoon. Keith works for Oxfam America. Eva is our office manager in Pantau's Jakarta. Keith began his sessions on mining Monday morning. He led two sessions. The first was an introduction to mining. The second on the "Resource Curse." He spoke softly and used Power Point projector to illustrate his points and to show many pictures from mining sites from Africa to Latin America, from the United States to Indonesia. I did the translation. Keith might be soft-spoken but his material is hard-hitting. 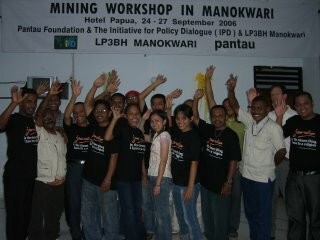 Many participants had better understanding of mining processes, environmental result and mining-related social issues. I conducted the third session Monday after lunch. Monday evening, some participants, Eva, Keith and I took a boat ride to Mansinam Island near Manokwari. It is a historial site. Two German missionaries came to this island in 1855 to start their mission works. 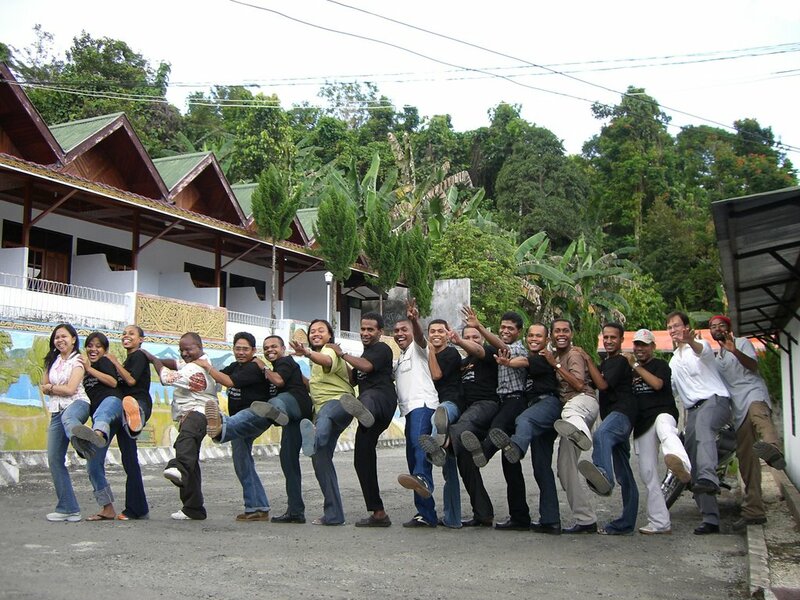 Papua is now a predominantly Christian area due to their pioneering works in Mansinam. Keith also led two sessions Tuesday morning. Media Papua daily headlined my comment that says Manokwari need not to have a PWI presence. Toharsat Saragih of LP3BH, a local legal aid group that helped organize the workshop, addressed the class at the third session. Eva and Keith left Manokwari Tuesday evening for Makassar. They stayed one night in a Makassar hotel prior to fly to Balikpapan. They also asked to debate Max Simataux on the Matoa FM radio Tuesday evening. We took some motorcycles to visit the Manoa station on a Manokwari hill. The view is breathtaking. Max, however, didn't come for the debate. Meanwhile, these journalists kept on talking and gossiping about the PWI's Max Simatauw ("a womanizer" or "using a rental car for free"). What I see is a resistance. The journalists feel that they're tired to be continuously cowed by the PWI. Since the end of World War II, the PWI is known to have mixing journalism and politics. Tarman Azzam, the PWI national president, is also a Parliament member, representing former president Suharto's Golkar party. One PWI founder became an Indonesian vice president. Many PWI leaders also became ministers and government officials. Tarman arrived in Manokwari from Jakarta Tuesday evening and opned the PWI conference Wednesday morning. The Manokwari workshop had three sessions Wednesday. I was encouraged to see that the workshop participants chose to stay with us than to attend the PWI conference. The conference is obviously a big event for most journalists in Manokwari. It is a relatively small town on the gorgeous Wosi Bay. Our workshop was still crowded Wednesday. Wilman and I said goodbye Wednesday afternoon. Several journalists took their motorcycles to the airport with us. Their message is, "Please do another workshop in Manokwari." I don't want to leave them alone. Wilman said it is the best workshop that he has ever attended. Mostly said it is the first workshop in which they are required to do homeworks (writing). I also told the journalists to start using bylines, firewall (lines to separate editorial content and advertisement), to acknowledge their news sources (not just saying in their stories' initials that the sources is "int" which means "internet."). They should acknowlege sources like Kompas, Associated Press, Reuters etc. Senang Anda bisa menikmati acara di Balikpapan. Saya tak bisa datang ke Balikpapan karena harus hadir di Manokwari. Waktunya bersamaan bukan? Keith Slack tak bisa tinggal terlalu lama sehingga kami mengaturnya dengan Budi Setiyono di Balikpapan dan saya di Manokwari. Eva jadi penghubung agar kedua acara ini berjalan lancar. Keith juga bisa pakai waktunya maksimal. saya kepingin sekali-sekali nongol di blog pak andreas. tapi foto bareng peserta workshop di balikpapan ada di kamera mas bintang. bijimane nih, pak? Tolong deh bikin satu feature kecil tentang pengalaman di Balikpapan. Lengkap dengan perkembangan mailing list pantau-pacific. Nanti saya pasang di blog saya. Sekalian saya akan minta foto dari Bintang atau Eva. Terima kasih.